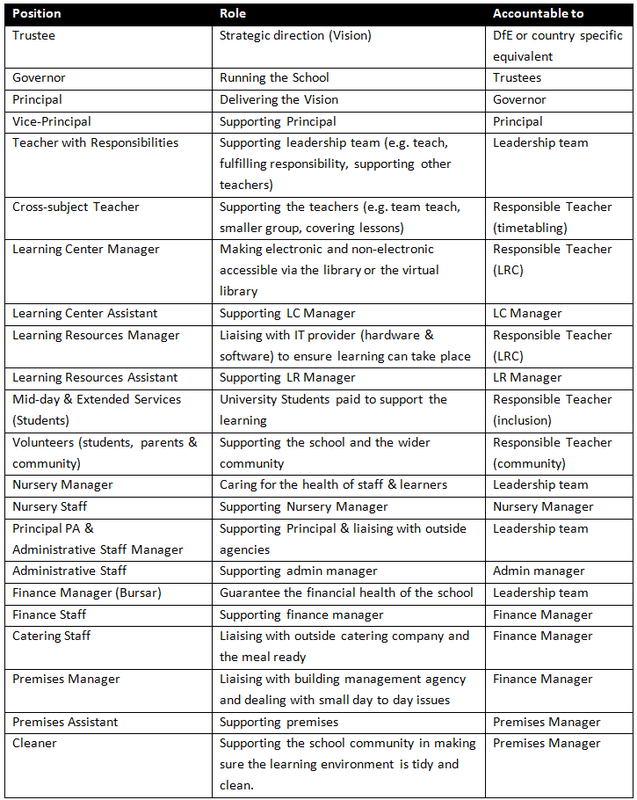 Connected Schools follow a hybrid Organisational Structure between a very small leadership team, teachers with responsibilities and non-teaching staff. The leadership team is limited to Principal in charge of the whole school, including the transition at preparatory school, a vice-principal overseeing primary provision after 3 years and a vice-principal overseeing secondary provision after 6 years. After that, all teachers will be responsible for as many aspect of the school and will be accountable to the Principal directly or one of the two vice-principals. 5 teachers will be hired with each intake during the first 3 years. 10 teachers will be hired in year 4 and 5 due to a new intake in primary school and preparatory school at the same time. Then again, 5 teachers will be hired during the following 5 years. Excluding nursery, the school will therefore have 60 teachers to cater for 810 students after 10 years going from Primary to Post 16. A strong IT Platform will enable all the members of the staff to have an input, collaborate and participate in the school life productively. Non-teaching staff will therefore be accountable to the leadership team or the relevant teacher with responsibilities. After the Principal Designate, the rest of the staff will be hired with a focus put on the fact that every teacher in the school will be responsible for an aspect of the school life. The candidates will be asked to write a short text using the scenarios as a starting point (online) they will also be asked to film themselves delivering a short section of their favourite lessons. Finally, they will be asked write a short create an artefact about the person they find the most inspiring. All that information will be shared through an online environment that will enable the candidates to familiarize themselves with the school and the current team. The leadership team will therefore be kept to a minimum. Notably, there will be no Vice Principal during the first two years and potentially after. There should be no need for supply teachers as the school would be using multi-subject teacher or merge classes together if a teacher is absent. In the exceptional case where the number of teacher on leave is above 50% of the total staff we would contact an agency as merging more than two classes would hinder the students learning experience.